The Roden kit is an excellent rendition of this historic aircraft. The overall fit is excellent with just a small amount of filler necessary. I added details to the interior using pirated photo etched parts from other kits. Seat cushion was enhanced using white glue. Rigging is 2lb. test Trout fishing line. Paints are Gunze 34087, PolyScale CDL, washes of Artist Oils, and finally washes of water colors. My model represents the SE5a (Viper Powered)flown by Lt. hank Burden in 1918. Decals are americal Gryphon,and Roundels from Blue Max. Exhaust pipes on this aircraft were shortened. Hank Burden left a detailed sketch noting markings and colors. His description of the uppersurface color was "Green". Wrinkled fabric effect was a simple process. Delta Ceramicoat brushed on thickly, then shaped with a pointed brush to desired shape. Finally, the aielerons were offset with the left slightly down and the right just a tiny bit down, a feature noticed in photographs in several publications. This is the WNW kit, again virtually out of the box. I added control wires to the cockpit using Monofilament flyline leader. I used Humbrol Paints mixed to represent a PC 12ish finish for the upper surfaces, and X Tra color British CDL for the Unders. Decals are kit Decals. 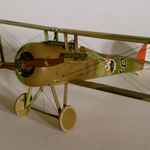 This kit represents a Nieuport 28 from the 27th Aero Squadron, 1st Pursuit Group in 1918. The kit is out of the box with the exception of a resin Peach Basket seat from RK Models, and a few of the pieces of PE from Part. All rigging is Fly Line Leader and turnbuckles are simply white glue painted in appropriate colors. The paints used were a combination of Polyscale and Aeromaster. Overall fit is excellent with the wings being just a little tricky to mount. This is the Wing NUt Wings Salmson 2A2 in USAS markings. Decals are by Pheon. I used the recommended Tamiya mixtures for the 5 color camo scheme. Rigging is Monofilament fishing line, 2lb test trout.